An inn whose site cannot be located (although it stood on the Cosgrove side of Watling Street) was the White Lion, bought by Thomas Penn in 1636 and sold by him to John Wooddell, a London innholder, in 1647. Two years later Wooddell conveyed the property to John Hobbs of Old Stratford, who married Thomas Penn's daughter Mary and died in 1654. The White Lion later passed to his nephew William Hobbs, who in 1688 left the property to his wife Mary and then to four sons. Could this have been renamed the Welsh Harp perhaps? A house which definitely stood on the Cosgrove side of the main road is described as the Welsh Harp (suggesting that it had once been an inn) between 1689 and 1717, when it belonged to the Penn and Webb families. The Falcon: George Emmerson was the owner by 1653, in the indenture for the Welsh Harpe, 1689 it mentions a John Emerson as the neighbour on the south east side. 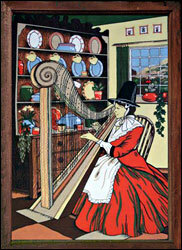 From this we might perhaps conclude that the Falcon and Welsh Harpe were close neighbours. 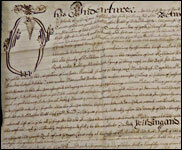 This indenture: made this first Day of Aprill in the first yeare of the reignes of Our Soverignes Lord and Lady William and Mary by the grace of God of England France and Ireland King and Queen defenders of the faith etc. Annoq domini 1689 Betweene Silverster Penne of the West Side of Stony Stratford in the parish of Calverton in the County of Buckinghamshire Tanner of the one part and Silvester Webb of Old Stratford in the parish of Cosgrave in the County of Northamptonshire Cordwainer of the other part Witnesseth that for and in a consideration of the Summe of Twenty poundes of good and lawfull money of England to him the said Silvester Penn by the said Silvester Webb at or before the ensealing and delivering of these presents in hand well and truly paid (the receipt whereof he the said Silvester Penn doth hereby acknowledge) and thereof and every part and parcel I hereby acquit ex…. And forever discharge the said Silvester Webb his Executors and Administrators and every of them by those presents he the said Silvester Penn hath granted demised sell and to Harrie letten And by those presents doth grant demise se.. and to Harrie lett unto the said Silverster Webb his executors Administrators and Assigns All that Messuage Tenement dwelling house and pightle thereunto belonging and adjoining containing by estimation halfe an Acre (be the same more or less) situate standing lying and being in Old Stratford aforesaid in the parish of Cosgrave in the County of Northampton and now in the occupation of one Katherine Webb widow her assignee or assignes and commonly called or known by the name of the Welsh Harpe The High Road called Watling Streete Road lying and being next on the West side thereof The house and Pightle now in the occupation of John Emerson butting next South East And the house and Pightle now in the occupation of one John Marriott standing and being next North=West. Together with all and singula houses out=houses ediffices Buildings barnes Stables yards Orchards Gardens backsides Walles Fences Mounds Hedges Ditches trees woodes Underwoodes Wells water water-courses Commons and Common of pasture ways easements pathes passages priviledges profitts Commodities advantages Emolluments Hereditaments and appurtenances whatsoever to the premises aforesaid belonging or in anywise pertaining or therewith all any part of parcell thereof commonly used occupied or enjoyed or knowne accepted reputed or taken to be any part or parcel or member thereof. And all the Estate right Title interest use possession yearly benefitt claime and demand whatsoever of him the said Silvester Penn his heirs and assigns and every of them in to or out of the same premises and every or any part or parcel thereof And alsoe all Deeds Evidences and writings touching and concerning the said premises only or only any part or parcell thereof To have and to hold the said Messuage Tenement or dwelling=house and Pightle and all and singular other the premises herein before granted and demised or meant mentioned or intended to be by those presents granted or demised and every part and parcell thereof with their and every of their appurtenances unto the said Silvester Webb his Executors Administrators from and immediately after the decease of the aforesaid Katherine Webb mother of him the said Silvester Webb (who hath an Estate for and during the terme of her naturall life of in and to all and singular the said premises herein before mentioned with the appurtenances when soever it shall happen for and during and unto and continuing the full end a Terme of Five hundred years from thenceforth next and imediately ensuingand fully to be compleate and ended Yeilding and Paying therefore yearly and every yeare dureing the said terme unto the said Silvester Penn his heirs or assignes the yearly Rent of one Pepper Corne only at the feast of St Michaell the Arch=Angell if the same shall be lawfully demanded And the said Silvester Penn for himself his heirs Executors and Administrators and for every of them doth hereby o.. and miss grant and agree to and with him the said Silvester Webb his Executors Administrators and Assigns and to and with every of them by those present in manner and forme following (that is to say) the full Summe of Twenty Two pounds of good and lawfull money of England in maeere and forme following (that is to say) Tenn shillings (part thereof) on the first day of October next ensueing the date of these presents Tenn shillings more (part thereof) on the first Day of Aprill which shall be in the yeare of our Lord God One Thousand six hundred and Ninety, Tenn shillings more (part thereof) on the first day of October which shall be in the said yeare of our Lord God One thousand six hundred and Ninety and Twenty pounds and Tenn shillings more (residue thereof) on the first day of April which shall be in the yeare of Our Lord God One Thousand six hundred and Ninety and one without any frand? Or further delay deduction deflation diminiation or a batem: for any manner of Taxes or other matter or thing whatsoever. 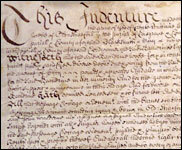 Provided always under the lesse and upon the expresse Condition and it is hereby u.tually cause to be paid unto the said Sivester Webb his Executors Administrators or assignes or to any of them, the said full Summe of Twenty Two pounds of good and lawfull money of England on the said very days and times herein before limmited and appointed for payments therof and according to the purport tenour true intent and meaning of the Covenant in that behalf herein next before continued and other said parties hereunto, That then and from thenceforth this present Indenture and every Grant Covernant clause Article and thing herein contained shall cease determine be utterly used? Frustrate and of none effect in the Law To all Intents constructions and purposes whatsoever Anything in those presents contained to the contrary thereof in anywayes notwithstanding, In Witnesse whereof the parties first above named have to theses present Indenture inter changerably sett their hands and Seales the Day and yeare.